Paul Haydock has asked us to share the details of this excellent meeting with you all. Entitled 'Three Decades Of Heart Failure' this national meeting combines heart failure experts from across the UK and looks like an excellent learning opportunity. It takes place on 23rd and 24th November 2017 at the Queen Elizabeth II Centre in London. Our very own Peter Cowburn is one of the program directors with Wessex heart failure also being representing by both Paul Kalra and Jayne Masters. An Oxford trainee by the name of Jo Grogono has taken on the responsibility of British Society for Heart Failure Rep for Oxford/Wessex. Please also feel free to contact me (paul.haydock@uhs.nhs.uk) at the same time, as it would be nice to know those who are coming through. I am very happy to be approached for advice on training matters and opportunities locally and further afield. The 5th Leeds EP Core Curriculum Course (LECCC 2017) will take place this year on November 30th & December 1st. 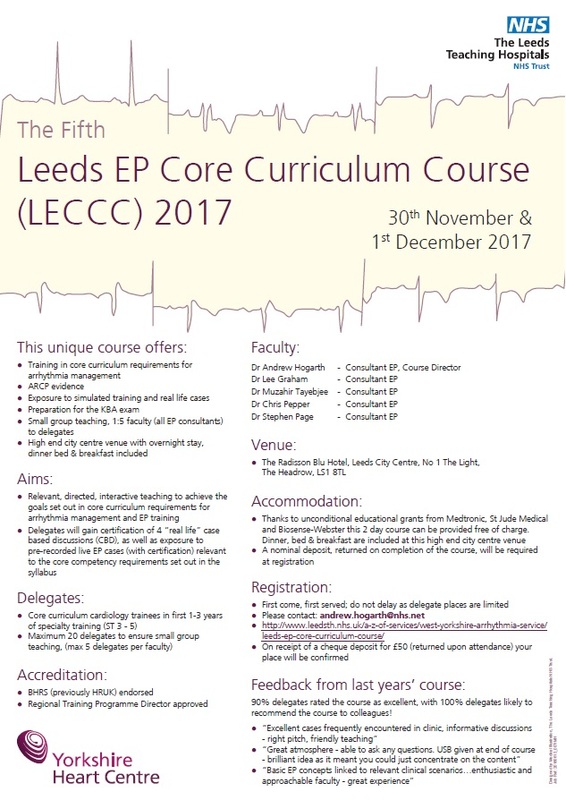 This is an excellent course for ST3-5 trainees which covers all of the core EP curriculum using small group teaching and case based discussions. The course is held the Radisson Blu Hotel in Leeds and amazingly it is provided completely free if charge. This means free overnight hotel accommodation and a free dinner on the evening of the 30th November, not to mention the two days of teaching. You only need to cover the cost of your travel to Leeds to attend. I went on this course in 2014 and thought it was excellent. You even get certification at the end that you have undertaken four Case Based Discussions. I would highly recommend it to anyone with an interest in EP. To book a place you need to contact the organiser Dr Andrew Hogarth directly who will then want you to send a nominal deposit which gets returned to you on completion of the course. Dr Paisey has asked us to share this educational opportunity with you. The 3rd Cardiac MRI Conference will take place in Liverpool on 26th October 2017. This is a national conference orgainsed by the North West Education Cardiac Group. The theme this year is Ischaemic Heart Disease and the cost to attend is £30, which includes lunch.